What does one expect from a James record these days? James have always been about jamming and feeling the groove, and some of their most successful songs and albums have emerged after a seemingly endless foray into the realm of the unexpected. But even here you might find the typical James record full to the brim with 'James' type anthems and ephemera. And haven't you always suspected them of being capable of something else? Enter The Morning After. James are Tim Booth (singer), Jim Glennie (bass), Larry Gott (guitars), Saul Davies (guitar, violin), Mark Hunter (keyboards), David Baynton-Power (drums) and Andy Diagram on trumpet. This is the line-up that recorded Gold Mother (spawning the hits How Was It For You, Come Home, Lose Control and Sit Down), and Seven (although Diagram was absent for the subsequent Eno-produced Laid and Wah Wah albums). It is also the line-up responsible for the band's superb recent new mini-album The Night Before and the imminent new companion piece The Morning After. Naturally, with The Night Before in the bag, the deal was to complete the UK tour (which culminated in their first Albert Hall headline show) and head for a studio where they could spend five days recording together in a big room with no overdubs and with a view to capturing "something spontaneous". This idea came about due to the diversity of the FTP sessions the band worked on and the realisation that they were writing two completely different kinds of song. James naturally come up with beautiful, quiet pieces of music anyway but rarely do more than one or two ever make it on to a long player, and this time they wanted to make a whole album like that. The results are The Morning After and eight tracks that stretch the James envelope further than it's ever been stretched before. Aside from Gott's outline work, The Morning After has its origins in the recent tour, and true to their word the band really did just take the one day off (for promo!) before recording. The record has an intuitive, low-key "campfire" feel and features some of the saddest, darkest lyrics Booth has ever come up with. The bluesy opener Got The Shakes is a song about an alcoholic guy waking up and realizing he has beaten his wife, where the line "some people shouldn't mess with the thunder" is as menacing as it sounds. Dust Motes concerns a man checking the dust motes in the light, devastated that his relationship is over, and the kiss-off line "I'll forgive you your transgressions, I'll forgive you – if you die!" is as clever, funny and twisted as this paradox suggests. Tell Her I Said So is about Booth's mother dying in a home (which she compares to boarding school – "staff are cold, the rules are rules, how can children be so cruel") – and her being shocked that her life should end this way ("if I could leave I wouldn't stay, never thought I'd end this way") and yet here are the first signs of light: the song suddenly embraces disco, employs a childrens' choir to sing the refrain "here's to a long life, here's to a life that's lived too long" and becomes curiously life affirming. It's a respite of sorts. Acceding all that, The Morning After's key track could easily be Lookaway for the simple reason that it is almost impossible to listen to it without singing along: this is electronica (if not Electronic!) without the indifference, a song about not facing up to the facts and where the line "All that really mattered - you weren't in the building when the walls came crashing down" is bleak beyond compare. But you want bleak? Listen to the album's closer Fear, for here is a song with a mood and a mission. Atmospheric, experimental, and just a little bit haunted, Fear tackles that dominant inner monologue that stalks (perhaps) the life that's lived too long: "Fear fights for the driver's seat/Keeps breaking the chain/Next time he rides in the boot/We got wise to his game". Whilst James - the phenomenon - has gone on to release ten studio albums and sell a total of 12 million albums worldwide, James - the band - has undergone a personal history that would have killed off lesser individuals. 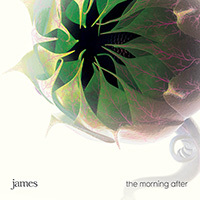 The Morning After will be released on September 6th 2010. Prepare to be astonished.